To me the extant surviving instruments are like treasure-houses of detailed specific data about not only the historical instrument design and construction, but also about all other aspects of the historical music-making (because of the presumption that the original instruments were commissioned by discerning musicians). So I would regard every last detail about the old instruments as having something important to tell us. And as a player investigating the old music traditions, I want a replica harp that is as close as humanly possible to the old museum examples. Of the two oldest Gaelic harps, the Queen Mary and the Trinity College harp, I would say they are remarkably similar in design and construction, and that similarity points to a shared conservative instrument-making tradition and a shared conservative music-making tradition, covering Ireland and Scotland. Similarities between them I take to be confirmation of that shared tradition; differences between them become specific individual features of that particular instrument. (you can do the same exercise with the later harps but there are more differences then. The Trinity & Queen Mary are by far the most similar pair I would think). The Queen Mary harp is far easier to consider since a lot more info has been published on it, mainly the study in 1904 by R.B. Armstrong and more recently Karen Loomis’s ongoing study of it which is published in interim in the Galpin Society Journal 2012. The Trinity College harp is far less well studied or published; the information in Armstrong’s 1904 book is a lot more sketchy and has as I understand it at least one misleading error; and there has not been any further more recent published work than that. When I commissioned my own harp (which is a copy of the Queen Mary harp) I insisted that my maker simply copy every aspect he could see with as much fidelity as possible, from selection of timber through to decoration and even the idiosyncracies of individual fittings and adjustments. The idea being to end up with a new instrument that was as close as possible to handling the real thing in as many respects as possible. Since then, Karen Loomis’s work producing 3D X-ray models of the instruments and materials analysis, has revealed important structural and decorative information that would have led to some different decisions being made with my copy, but that is part of the learning process, and Karen’s study has directly addressed certain questions which were raised by my commission. When I worked with David Kortier on the HHSI Student Trinity Harps, this was a somewhat different project. The initial aim here was simply to obtain a set of affordable harps for use in summer school classes. We were not satisfied with any commercially available models so we approached Kortier to discuss options and he ended up making a custom student model for the Historical Harp Society of Ireland. The main design criteria for this student harp were that it be affordable and quick to make, but that it present a student in class with the string count, string spacing, ‘feel’, and overall ergonomics of the original harp. So you see there was no attempt made to reproduce the subtleties of construction or decoration; but from the beginning the exact geometry and ergonomics of the strings were the most important thing. This was so that a class student given one of these harps would instantly be learning the finger movements and playing techniques exactly as on a proper replica (i.e. exactly as on the real thing! ), even if the nuances of sound and response were not as accurate as could be obtained by a proper replica. We based the first HHSI Student Harp on the Trinity College harp because it is the Irish national symbol and this seemed appropriate. Kortier had visited Trinity College and inspected and measured the original some time before, so he was able to use a lot more than just the published data; even so there were a number of details that had to be guessed or interpolated simply because the data about the original is not available. I mean the data is there, it exists, but it is locked away inside the fabric of the instrument itself and would need a long term detailed programme of scientific analysis like is happening in Edinburgh, to discover it. So in summary, reconstructing an instrument from the surviving old instruments really needs a partnership between high-tech scientific analysis of the original, and a highly skilled sensitive craftsman-artist. In practice, you have to compromise and make do with what you can get – most of the compromise to date being on the analysis side I have to say. 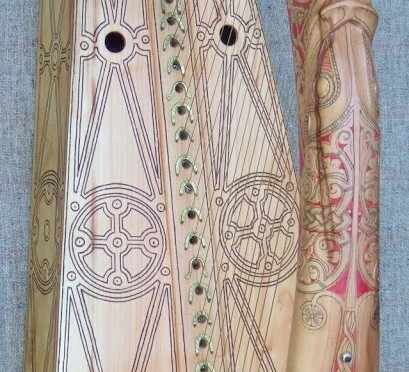 I hope that the recently published ongoing work in Edinburgh will soon feed into the work of the artist-craftsmen and we start to see really high quality accurate replicas that take on board and accurately reproduce these important new discoveries about the detailed features of the old harps. Every level of data is vital – from the large scale measurements of height, width, string count and string lengths etc, down to tiny details of alignment and adjustment and profiling, all combine to give a very particular playing experience of the musician with important implications for what is and is not idiomatic for that particular instrument – and as our mission is to rediscover the lost old historical idiom, it seems to me that the idiom of each specific historical instrument (or rather, the imperfectly recreated idiom of each attempted reconstruction) is a vital tool for this. And that means that each reconstruction has to be as close as humanly possible to the specific museum original to have any value in that process.